Those recovering from cancer 5 years prior may enlist for combat, HIV-positive people will be recruited; overweight will receive 72 profile. 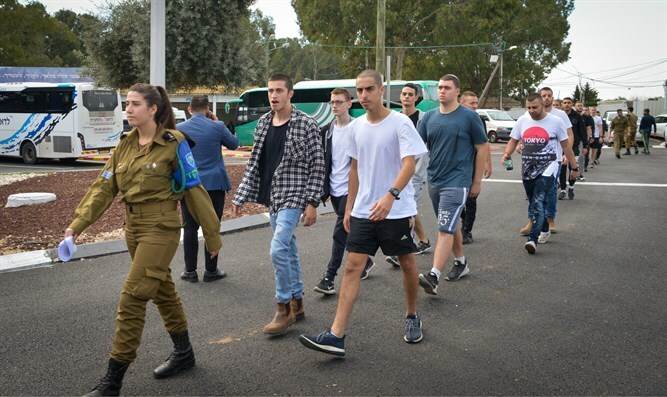 The IDF will allow young people who recovered from cancer five years before their enlistment to enter combat service and will start accepting HIV-positive people, the Yisrael Hayom newspaper reported. According to the report, these and other changes are expected to take effect in January 2019. The change is being implemented after two years of intensive Medical Corps work. The army explained the goal of the change is to "place the right person in the right place in the IDF, in a way that the person himself will not be harmed, and the job can be done in the best possible way." Yisrael Hayom's IDF correspondent Lilach Shoval notes the most significant changes expected to date relate to HIV carriers, who until now have been given a profile of 21, that is, an automatic exemption from military service. Until now, the IDF would have offered them to volunteer for service, but the choice to enlist was in their hands. According to the new change, the carriers would be recruited by law with a 45 medical profile. The army explained carriers will receive a non-combat profile, since they must take medication regularly, and at this stage the army cannot guarantee their supply if for example, they cross enemy lines in a war. There are a total of 10 to 15 such conscripts a year, with five of them usually volunteers in the IDF anyway. The newspaper also reported that another significant change relates to young people who had cancer as children and recovered five years or more before enlisting in the army. Until now, these young people would have received a maximum 64 profile. Following the change, the young people who recovered from the serious illness will be given a 72 profile, enabling them to serve in some combat units. The army explains that if the five-year recovery period passes only when they turn 18, young recruits will be able to change their medical profile five years after the disease and request a change in placement. The potential of recruits for combat following this change is about 100 per year. The army stressed that giving combat profile 72 will not be automatic, but will be given to young people who have recovered, subject to medical examinations. According to the new definitions, some of the more overweight draftees who joined combat units with a 97 profile will now receive a 72 profile that allows combat service but not in all units - with the intention of preventing their dropping out of service. According to the report, the revision of the profile book is the largest change in profiles in the IDF since 2005. Profile 97 is the highest medical profile, while Profile 21 is given to a person who is unfit for military service for physical or mental reasons. Those with such a profile may ask to volunteer for the IDF.